Since writing my entry on “How to write good meeting minutes“, it’s been quite a popular search term (and thanks Google for all the referrals!). I’m not sure why people are writing a lot of minutes at the moment (or at least looking for information about it), perhaps it’s to do with the fact that our roles are becoming more diverse and we’re being asked to do tasks that weren’t previously expected from us. Anyway, the number of hits I’ve received indicates that people aren’t comfortable sitting taking minutes, or aren’t being provided with the proper training and tools to do so. Make sure the “Action Points” are clearly defined – If John is meant to research a certain subject, make it stand out from the rest of the minutes content. This allows people to see what they’re supposed to do quickly without having to read through piles of irrelevant material. Write the minutes up as soon as convienient – Ideally this should be just after the meeting, but normally this isn’t convienient – that’s where your excellent notes come in. Distribute the minutes in a timely manner – This thought occurred to me after writing the original entry. There’s no point writing the minutes up if you don’t send them out until 2 days before the next one as no-one will be able to actually “Action” their action items! 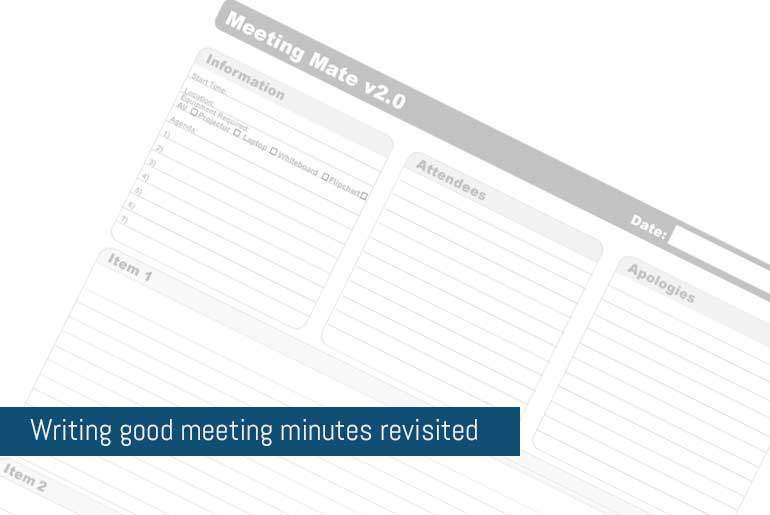 As an addition to “How to write good meeting minutes“, I have come up with a template for you to download (see below for the link) that will hopefully help you to format your meeting notes so that you can write them up in a readable manner later on. Firstly, let’s touch on something I left out of my last entry, how the meetings run. Ask 100 different people that question and you’ll get a lot of different answers. Some prefer short meetings, actionable items, clearly defined goals, free coffee – the list goes on! To me though, a good meeting has a solid agenda and doesn’t run off the rails at every opportunity. Agenda? Why bother we all know why we’re here! Having these points outlined at the start of the meeting (you send your agenda around before the meeting – don’t you?) means that everyone knows where they are and what they’re doing. If “Human Resources” isn’t on the agenda the only times it should be mentioned is under “Matters Arising” or “Any Other Business”. Of course, if “Human Resources” has a pressing matter to discuss, it can be added to the agenda before the meeting. I’ve got my Agenda, now what? Make sure that you stick to it! As mentioned previously, going off on tangents is hugely frustrating, adds little value to the meeting, has no relevance and drives people barking. When you start the meeting, let people know that you appreciate their time, how long you anticipate the meeting to last, and any goals you wish to achieve. This sets the tone for the meeting and everyone knows what to expect and where to stand. Hey, isn’t all that the Chairman’s Job? What about the poor secretary? If you refer back to “How to write good meeting minutes” you’ll have a good starting point as to how to write your minutes up. Of course everyone is an individual and has their own style. As you take more notes and write more minutes, you’ll develop your own too. However, if you’re still finding all this a bit daunting, there’s a handy little download for you called “Meeting Mate” (PDF – 364KB). Okay, Looks pretty so how do I use it? This section allows you to enter the start time, location and equipment details for reference when you set the meeting room up (don’t you just hate it when you forget the projector?). This section also allows you to note the Agenda Items (which relate to the following section). You can also note down attendees/apologies. These relate to the items as outlined in the section above. Enter the title of the Agenda Item and your notes. There is a column on the right to help distinguish “Action Items” from the rest of the text. How you highlight “Action Items” is up to you. You may put a star against the relevant line or, as I do, the initials of the person the action relates to in a circle. This section allows you to write any other notes or extend Agenda Items. The notes section also has an “Action” column to demarkate any specific actions for people. I hope you find the “Meeting Mate” useful. Comments, as always, are welcome. Why do we need them? Who benefits from them and where did all the free doughnuts go? Oh yes, there are lots and lots. The question is, which one is best suited for your topic? Have you got everything you need? Hmm, I wonder! “Particularly agree that minute-takers should not “”be afraid to write too many notes””. Filtering through the written record after the fact is much easier than trying to piece together what happened when memories have begun to fade. There should be simultaneous listening and summarizing, if only to record the context of the discussion along with the words, yet the initial goal should be as comprehensive a record as possible.